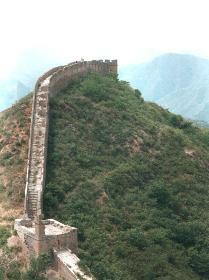 The Great Wall of China | Experience the Great Wall on foot and not in a car. 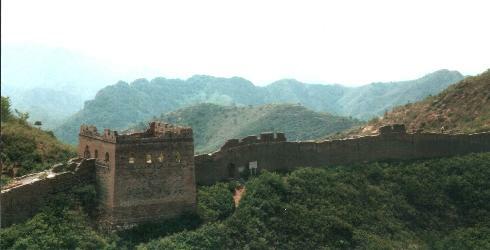 MUTIANYU, SEPTEMBER 1999 - SIMATAI, JUNE 2002 - One of the biggest 'tourist traps' of China, maybe of the world. But still , it is just awesome to see it with your own eyes, and on my second visit to the great wall, I was again very impressed with its grandeur and atmosphere. I don't like to go twice to the same place, because when revisiting a place, the magic of the first time visit is gone, you compare with last time, etc... and of course there is simply not enough time in one lifetime to go more than once to the same places. 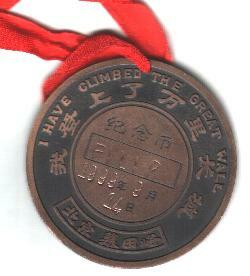 But with regards to the Great Wall , the story is different. I visited it two times, but I went to different sections of the wall, which gave me different views and only increased my awe for this masterpiece. And I experienced even more of the Great Wall as I traveled along it with the Trans-Mongolian train. This section is one of the more quiet places along the wall, but still a very touristy place. It is also an almost fully rebuilt section, which makes walking a lot easier, but still hard - the first impression remains 'I didn't imagine it to be so steep, so high...'. I was there on a hot and sunny day, and the views from the wall on the surrounding mountains were absolutely stunning. We walked for about one hour along the wall and the same way back, doing a lot of stairs .. ! On the wall we met several girls selling medals, and of course I bought one... just couldn't resist. Also we met 'Ghengis Khan' (in full gear, including bow and arrow) and he wanted to have his picture taken with us (for a small fee of course...) - but we could escape from this one. But we could not escape the line of T-shirts-and-other-stuff-vendors at the endpoint of the walk... there is simply not another way to go and there are so many of them... but it is all part of the experience, after all you are in China's tourist trap number one ! At some points the wall is so steep that it seems almost like a ladder. And walking really gets tough sometimes, but the view from the highest point on the wall and the different watchtowers and the mountains, it makes it so worthwhile. This is one of the experiences you wish it could go on for a long time, but you have to stop at some point because it exhausts you at the same time. But the images in your mind last forever. The pure beauty of the surrounding nature and the large architectural structure of the wall itself, it is not your everyday fence, wall, transportation hub or tourist stop. It is something you would want to walk as far as possible, you wont be able to drive it so you might just think to yourself, I want to sell my car, but don't do that because when you're done seeing and walking the majestic wall, you'll need some transportation. Three years later, and the images were still fresh in my mind.... I was a bit afraid I would be disappointed from this second visit, because after all I had seen it already, and maybe the reality would turn out to be less splendid than the great images in my mind ? But soon, my worries were gone, because Simatai turned out to be absolutely fabulous and in comparision to Mutianyu a stronger experience. We got to the starting point with the bus, and then I walked all the way back to Simatai for more than three hours. Simatai is a non-rebuilt part of the wall, and that makes the walk a real adventure, and results into very atmospheric views. 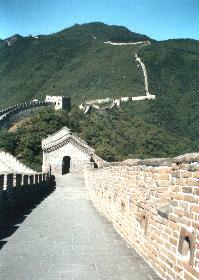 The walk was really exhausting, as the wall goes up and down all the way, with 25 watchtowers on the highest points. It was hot, 36 degrees or more, and I had 2 litres of water with me, and I needed more ! By the way, the watchtowers are the only places where you can rest and cool down for a while. But we had good company...Already from the start of the walk, we were followed by a group of about 15 Chinese and Mongolian girls, and one old man. They were very 'worried' about us, warning us all the time for loose rocks, offering us drinks, etc... of course this was a selling trick, but we enjoyed their company a lot. We shared our drinks and snacks with them (some of them had never seen pringles)... and we had a lot of fun. After about one hour, they told us all they had to go home, and they all told us 'please buy book, T-shirt, postcards... we are so tired, we will not make it back, we are hungry, we have no money, look at holes in our shoes....' What a nice performance of 'Great wall acting' ! I bought a T-shirt because I tought they deserved it , after all I was on holiday, and they did this walk multiple times a week, and we have had a great time with them. The train stops there too !